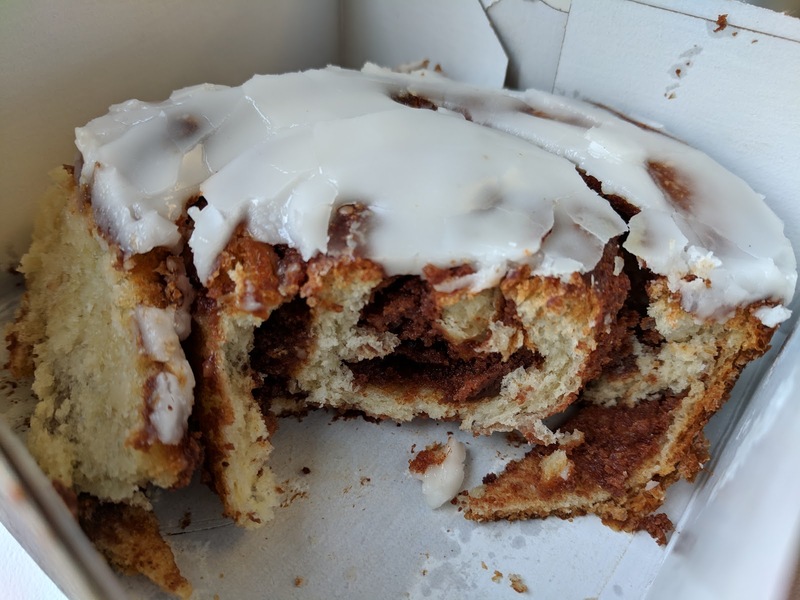 Hot on the heels of my amazement last month that Panera introduced basically kouign aman to their lineup, I tried another new pastry item, the cinnamon roll, and was even more impressed. "A freshly baked roll made with our sweet dough, stuffed with cinnamon-sugar filling and topped with decadent vanilla icing." I've been eying these cinnamon rolls since Panera introduced them late last year. They seem to be crowd pleasers though, or perhaps hard for Panera to make in quantity, as literally any time I have arrived post 11am they are completely sold out. I only ever see them earlier in the morning, and they usually have them still in the baking pan, with only 1-1 left. So I finally ordered one in advance, through the app. It was ready and waiting in the rapid pick up area. I knew that that the cinnamon rolls are large, because I had seen them before. I still gulped when I picked up my box to see that it was literally full from the single cinnamon roll. I laughed remembering that this was listed under the "pastries for one" section, as they also sell these as a four-pack. You might ... wanna split it with a friend, or at least save half for after lunch? It also had a rather generous amount of icing on top. I hoped the icing would be good, and, it was. Super sweet, actually vanilla flavored, and, as you can see, plenty of it. I really enjoyed the icing, the best element at room temperature, as Panera serves it. Vanilla Cinnamon Roll: Side Profile. I was impressed when I cut into the roll to see that it truly was stuffed with cinnamon-sugar filling. There was a generous amount of filling between the rolls. It was well rolled. Really, a nicely constructed pastry. I was not particularly impressed with the dough itself, it wasn't fluffy or moist as I hoped. 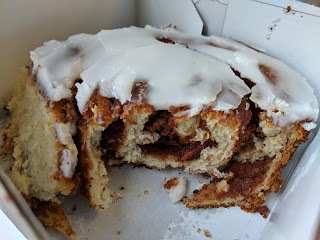 At room temperature, I basically thought it was better than most chain cinnamon rolls, and applauded the construction and icing, but I figured I'd hand it off to my partner later. But first, I had to try warming it up. It was *much* better warm. While the dough didn't improve in a dramatic way, it was certainly better warmer, and the icing melted into more of a sticky caramel, which I enjoyed. Totally different from the already tasty icing, but, it worked well with the cinnamon, making it more like a sticky bun. And then I added my favorite vanilla ice cream. Warm cinnamon roll turned sticky bun with melty ice cream? That was a winner. So my protip: don't bother with it at room temperature. If you want to consume it at Panera, consider a quick trip in the microwave (every Panera has one!) perhaps, although I didn't try that. My partner does swear by microwaving (very briefly!) cinnamon rolls and glazed donuts. I'd get it again, but only with intentions to eat it warm and a la mode, not for breakfast. Thank you Panera. That is what I have to say. They finally re-vamped the pastry section of the menu, eliminating or changing so many of the items I never liked. The lackluster Pecan Braid is reformulated. The sad Cobblestone is gone. So is the Pecan Roll I never liked. Also removed are the old cheese and cherry and cheese pastries, which opened up space for new additions. "We improved the dough quality of our previous Cherry and Cheese Pastries, then enhanced the product even more!" They do seem to realize though that the dough left something to be desired before. So that is something. The Brittany comes in two varieties, cheese, or cherry cheese, the later of which I tried. Cherry Cheese Brittany (December 2018). $2.99. "A freshly baked, flaky butter pastry filled with cream cheese filling and topped with cherry filling." Well, it didn't look half bad. 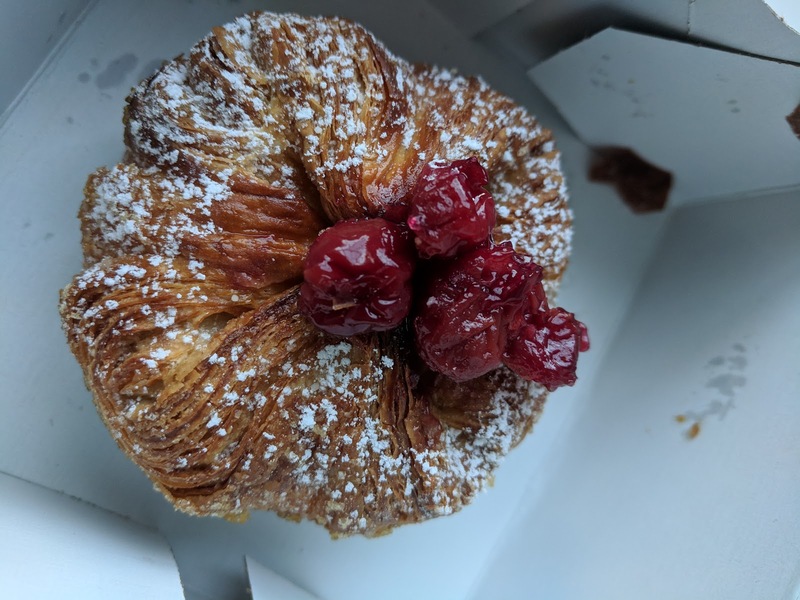 It didn't look soft and spongy, and really did look like a real kouign amann. The powdered sugar on top was appealing, as were the cherries. It was ... ok. Probably most would even consider it good. 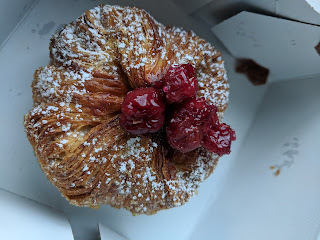 The problem for me was that it wasn't really a kouign amann. It was, however, a much better pastry than they ever offered before. The exterior was crisp, the dough came in nice layers, it was flaky. But it wasn't nearly as buttery nor caramelized and decadent as I expect from a kouign amann. The cream cheese filling was a good element, a decent portion, slightly sweetened, good texture. Nothing wrong there. And the tart cherries were juicy and flavorful, sticky in a good way. Really, if you just wanted a better cherry cheese danish or croissant, Panera did a good job improving this item. But if you want a real decadent deeply caramelized kouign amann ... look elsewhere. If you didn't read my original Panera baked goods review, I suggest you start there, and then return to this update, since I'm skipping the background this time around. See "Original Review, October 2014" below. 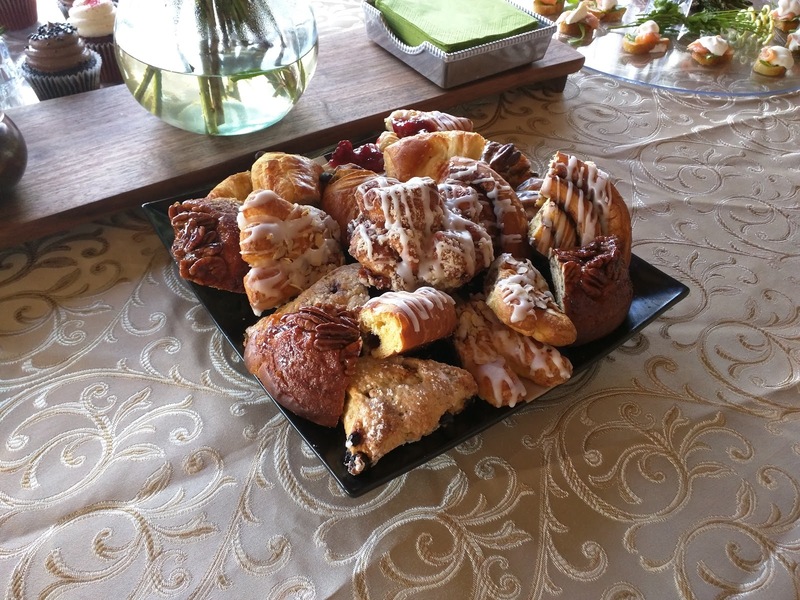 I recently attended a brunch where someone brought a platter full of Panera baked goods, nicely cut up into reasonable size chunks. 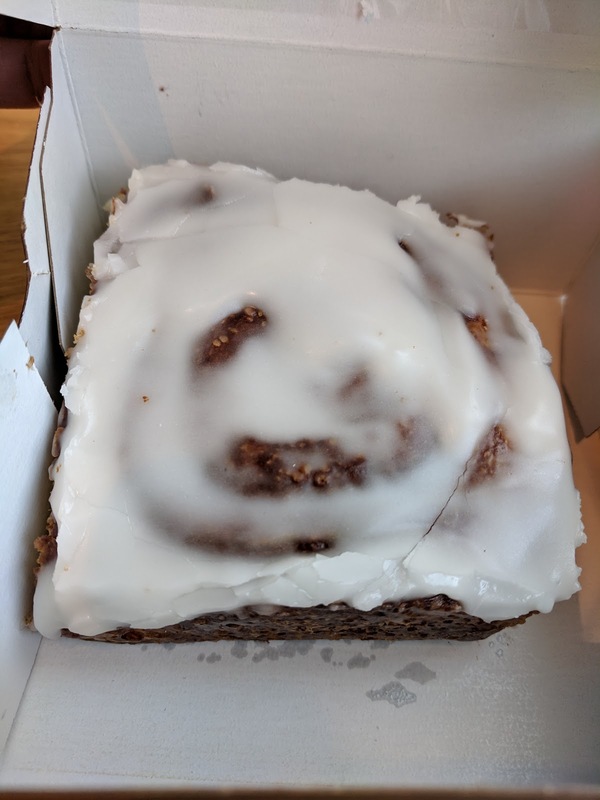 I used it as an opportunity to check in to see if the disappointing cobblestone sweet roll was still as lackluster as before, and to check in to see that the scones were still the best baked goods from Panera. Answer: yes on both counts. I also tried the pecan roll, which you can see peeking out of the front right and back left corners of the platter. Described as "Freshly baked sweet dough with cinnamon-sugar filling and topped with caramel and pecans." Sadly, it went exactly the same way as the cobblestone. It looked good. It *should* be good, given the lineup of ingredients. But, just like the cobblestone, it was really dry. You could see cinnamon, but it had no cinnamon flavor. There were plentiful pecans, but they were bitter tasting. And yes, plenty of caramel, but even that wasn't very good. Cinnamon Crumb Coffee Cake. $2.49. "An old-fashioned butter coffee cake, swirled with cinnamon and finished with a butter crumb topping." Ok, so this is weird. I don't know what happened to me. I headed to Panera, intending to get a blueberry scone, since I recently had one at brunch and I enjoyed it. And then I got to Panera and didn't want a scone. For some reason, the muffins called out to me. And of all things, the cranberry orange muffin looked good. I don't like orange flavor! And I've never liked a single muffin I've tried from Panera. I was paralyzed. Logically, I knew I'd hate the muffin. But I really, really wasn't feeling the scone. And I had a birthday free pastry to use. 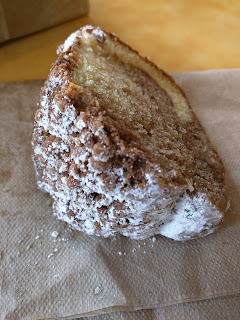 In my moments of total indecision, I saw the coffee cake. It didn't actually look good. And honestly, I don't generally like coffee cake. Heck, I don't even really like cake. But somehow it seemed like I'd get the muffin satisfaction, and have a chance of trying something totally different? I don't know what I was thinking. I think I remembered the really great streusel topping I had on top of coffee cake recently, and it inspired me. I just wanted streusel, really. My decision was made when I asked the friendly worker what he thought of the coffee cake. He told me, honestly, that all he does is eat the topping. He said the topping was awesome, but the cake was, well, just frozen thawed cake, and not interesting. But he loved the topping. Done. So I got it. Even though I don't like cake. Even though it didn't look good. Even though the streusel layer looked piddly. It ... wasn't awful at least. Better than I expected, honestly. But, really not great. The cake itself was not dry. Nor was it moist. It was very homogenous, non-offensive. There was slightly different flavors in the two colors, but I wouldn't be able to identify either as anything in particular. It was just plain cake. I didn't really taste any cinnamon. The topping was decent. It was sweet, slightly buttery. Again, no cinnamon. It was crumbly. But there wasn't nearly enough, which I could tell just from looking at it. The powdered sugar on top did help too. So, overall, not horrible, but not particularly exciting. Not that I expected it to be. I wouldn't get it again. The slice for $2.49 was in line with their other baked goods. It is also available as a whole cake. Last Monday, I reviewed a bunch of scones from Panera. The week before, I covered some drinks. A while ago, I reviewed their bagels and mufins. I've also covered the cookies. I'm not one for sandwiches, soups, or salads, so, what else remains? Of course, more baked goods. I'm skipping a real intro here, because you can read all about Panera in my previous posts. "Our pastry dough, twisted and braided with butter and freshly ground pecans coated with light sugar syrup for sweetness." I've had a thing for donuts, cinnamon rolls, and similar treats lately. I'm really not sure what it is, but somehow sweet bready things are just really appealing to me, particularly when paired up with a coffee. So when I entered Panera, although I was intending to get a bagel, I didn't make it past the pastry displays. Whoops. I was in the mood for a cinnamon roll, and Panera makes a cinnamon roll, but it hasn't ever looked good. It always looks kinda dry, and clearly doesn't have enough icing. They also make a pecan roll, which looks a little too far in the other direction, coated in sticky sweet caramel. I kinda think I'd love it as a dessert, but it was morning, so I was trying to pick a "reasonable" breakfast pastry. I went for the pecan braid, it looked like a compromise, as it had an icing so it would meet my sweet need, and it looked sorta like a twisted donut. I know the description didn't say anything about cinnamon, but I somehow thought that the filling was going to have a cinnamon flavor, and be a cinnamon-sugar mix with the ground pecans. It wasn't. It was really just ground pecans, so it totally didn't meet my cinnamon roll craving. Whoops. It also wasn't donut-style dough, more like a croissant dough, although not really light and flaky and buttery. So it didn't meet that craving either. Double whoops. As I said, the dough wasn't flaky, it wasn't buttery, it was a bit dried out even. It made me very glad I haven't bothered try any of their croissants, as those always look dry, and I'm pretty convinced now that they must be. I don't understand though how it was so stale seeming, as I got it at 10am, and they said their baked goods are all baked fresh at each location every morning? How could it be stale already? Anyway. 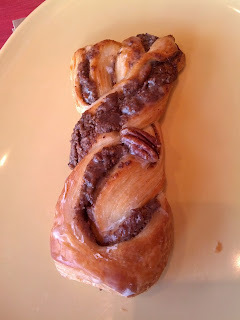 The form factor for this pastry was a success, I did like how much pecan filling there was, and the way it was twisted made every bite nicely distributed. But the filling didn't really have much going on, I wanted more spicing of some sort. The whole thing was coated with a sweet glaze that seemed to have a bit of an orange essence to it, although I'm not certain, and a single pecan half perched on top. Like many of the other pastries I've had at Panera, I really wanted it to be warm. It was just so unremarkable and dry at room temperature. I saved a chunk to bring home and stick in the toaster oven, because I was curious if it would be better. Indeed it was, it even seemed to get more moist this way. But it still wasn't that great, and I wouldn't get another. Unlike most pastries at Panera, I was not surprised by the nutrition stats, as they seemed fairly resonable: 470 calories, 26g fat, 24g sugar. Since the filling wasn't sweetened, the only sugar was the light glaze on top, so it made sense that the sugar wasn't off the charts like most of their goods. And the plentiful amount of ground pecan explains the fat content. An actual reasonable choice, compared to the rest of the sweet rolls, muffins, and scones. It turns out that I'd had this once before, as I discovered some tasting notes once I went to write this up. They read: "Icing on top not particularly good. Kinda soggy and not flaky dough. Didn’t pick up on much pecan. Meh." Whoops. While my notes weren't identical in context, I would have known better if I'd read them. The $2.49 price was fine for a baked good of its size.